The National Peace Committee for the 2015 general elections led by former military Head of State, Gen. Abdulsalami Abubakar (Rtd), have made substantial failed attempts to prevail on President Muhammadu Buhari to soft-pedal on his campaign against corruption in Nigeria to the delight of the generality of the masses. The masses have for long watched the national resources being selfishly shared by public office holders from Television screens powered by expensive fuel which adds salt to their fresh injuries. Meanwhile, the Publicity Secretary of the People's Democratic Party, PDP in the person of Olisa Metuh has described the anti-graft war as a new technique of victimisation of members of the opposition parties. He termed Buhari's attempt to recover looted funds as some sort of 'political lynching'. Charity begins at home they say, so if there is going to be a sincere and impartial 'change', President Muhammadu Buhari should clear the bush path from his own house as widely advocated. Obasanjo will always be remembered for the prominent role he played both locally and internationally in favour of President Muhammadu Buhari during the general election campaign which makes the former hold him in high esteem. Buhari will be forced to look over the former president's monumental record of corruption in the areas of the Halliburton bribery scandal, national identity card project, power project, Transcorp scam. The Economic and Financial Crimes Commission, EFCC and President Muhammadu Buhari have received petitions from an Integrity group in Rivers state as well as the Rivers state chapter of the People's Democratic Party on the alleged corrupt practices of Rotimi Amaechi while in power. They include the transfer of a sum of $105m from the sale of the Power Assets proceed account with the Access Bank, unlawful payment and the conversion of N4.6 billion by Clinoriv Specialist Hospital and Leisure Limited, enrichment of Messrs Collect Nig Limited used as a conduit pipe to the tune of N1.5 billion to defraud the state government. Strong rumours have it that Amaechi heavily funded the presidential campaign of President Muhammadu Buhari with the loots which makes him qualified for a presidential appointment rather than a probe. Lagos state has been termed as Tinubu's 'private business' and this is accounts for his 16-year political dominance over the state. Tinubu was one of the most instrumental backers of Buhari's presidential bid and this same supporter made the following assets out of government: Oriental hotel, Falomo shopping Complex, First Nation Airline, Lekki Concession Company, The Nation Newspaper, TV continental, Radio Continental, Renaissance Hotel, Ikeja shopping mall amongst others. Saraki, the former governor of Kwara state who was accused of assuming the post of the Senate Presidency of the 8th Assembly through a 'democratic coup' helped Buhari to secure the votes of electorates in Kwara state and largely in the South-West region of Nigeria. Saraki's political records are also tainted with acute corruption. He reportedly owns several properties in Nigeria worth millions of naira including a N700 million house in Victoria Island, Lagos that fetches him N96 million rent annually, he allegedly defrauded Societe Generale Bank of Nigeria, between the year 1999-2003, he acquired 15 luxurious including a Ferrari, mansion worth four million, two hundred and fifty thousand pounds in London, while his Wife, Toyin Saraki bought a house worth 10 million pounds in London far back as 2001 e.t.c. She is also on the EFCC watchlist for offences linked with her husband. Aregbesola has plunged Osun state into abject poverty as the civil servants haven't been paid for a period of 8-months. Imagine the plight of breadwinners with large families. Aregbesola also delivered his state to Buhari during the presidential elections. The National Publicity Secretary of the Yoruba socio-political organisation, Afenifere in the person of Yinka Odumakin has submitted documents of corruption allegations against Aregbesola to the EFCC but will anything come out of it? 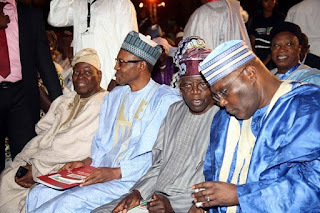 Atiku was one of the financiers of the All Progressives Congress, APC at the budding stage of the party due to his shortlived presidential ambition. Atiku's long history of corruption started from his days with the Nigerian Customs Service, he is allegedly worth $2 billion with most of his money hidden away in the Cayman Island, Switzerland, the United Arab Emirates. Atiku is placed on the United States government list of Specially Designated Nationals (the OFAC SDN), a list made up of corrupt politicians, terrorist financiers, mafia lords and miscreants across the world. Abdusalami is the leader of the Peace Committee of the 2015 general elections which is being termed as the 'Corruption Amnesty Committee'. Abdusalami has been described as a man with a close affinity to Buhari but his hands are not clean too. He has been linked heavily to the $182 Halliburton bribery scandal. This is contained in the new records obtained by the Paris-based Le Monde newspaper and the International Consortium of Investigative Journalists (ICIJ). Okorocha was Buhari's face in the Eastern part of Nigeria during the campaign period of the presidential election. This accounts for the regular visits of Buhari to Imo state and even after Buhari lost to his counterpart, former president, Goodluck Jonathan of the PDP in Imo state. Okorocha has been accused of the sale of all the General hospitals in Imo state to his friends from the Northern part of Nigeria, illegal deductions of salaries of civil servants for government identity cards, appropriation of state funds without recourse to budgetary provision, misappropriation of funds meant for local government councils and the Imo State Oil Producing Area Development Commission (ISOPADEC) and many other graft allegations. Hmmm..... President Muhammadu Buhari's anti-graft storm would forever be tagged 'partial and insincere' as long as it doesn't sweep the above people away or better still prove them innocent through a concrete investigation. I am the Village Town Crier!